Photo courtesy of the University of Iowa Athletic Program. While several people acknowledge him for his softball coaching brilliance, there’s another sport Rick Dillinger has taught student-athletes during his 42 years in high school athletics. Dillinger’s spent 39 years coaching high school girls basketball at three districts in Iowa including Danville, North Polk, and the previous two winters at ADM Community Schools. 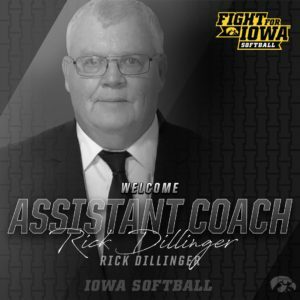 His coaching stint at ADM came to an end last week when University of Iowa head softball coach Renee Gillispie announced Dillinger as the newest assistant coach of the Hawkeye Women’s softball. ADM posted a 9-14 overall record in Dillinger’s last season in Adel, posting a 17-32 record in his two full seasons. The Tigers finished last years’ campaign 9-9 after starting the season with five straight losses. Finding Dillinger’s replacement has become one of the priorities for ADM activities director Reece Satre. The first official practice of the 2018-19 Iowa high school girls basketball season is 101 days from now on November 19.